For my maiden voyage into the world of From Beaks To Barks blogging, I thought it would be apt to introduce you, my future and present clients, to my own pet, Kody. Kody is a 5 year old Pekingese who was brought to one of the clinics where I worked two years ago by a local rescue group. They had picked him up from Town Lake after a ten day rabies quarantine and brought him to us for a health check. His previous owners had never taken him to a vet, so he was unneutered and unvaccinated–but that was the least of his problems. He had heartworms, three different kinds of intestinal parasites, kennel cough, numerous skin and eye infections, and fleas. He was also kind of a brat. Very scared of everyone and everything, we had a lot of difficulty trying to do that first examination on him, because he was constantly trying to bite! When he had first been brought in to the clinic, he gave me a jaunty little look that seemed to say, “I’m going home with you.” “No way,” I thought. I had no interest in bringing home a dog–especially a Pekingese. See, the love of my life, my cat Cassia, whom I had literally raised from birth, had passed away suddenly just a few weeks prior due to acute renal failure. I was still grieving for her, and wasn’t mentally prepared to bring in and love another animal. Furthermore, I have never had a small breed dog. All my life, I grew up with Boxers and other large working breeds. I also have never wanted to own a long-haired animal, for fear of being unable to properly care for their coat. 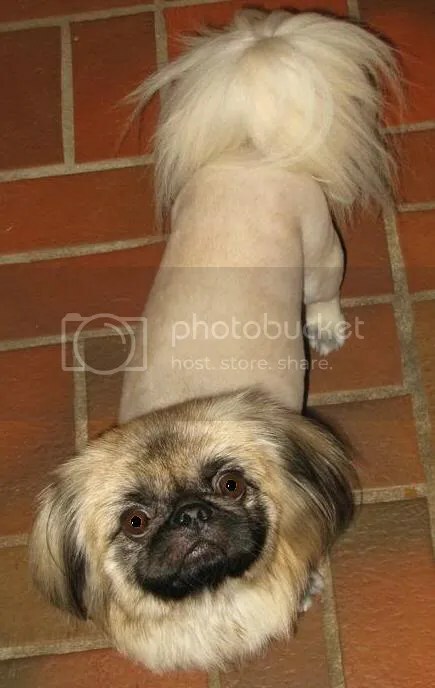 And I also tend to avoid breeds who, due to over-breeding and centuries of human cruelty, have a lot of genetically hard-wired health problems–Pekingese being a prime example of one of those breeds. On all levels, Kody was not a dog I would have ever, in a million years, expected to adopt. But Kody had different plans. Because of the medical treatment required, he had to stay at the clinic for three weeks. He almost died during the course of his heartworm treatment because he developed a pulmonary thromboembolism; luckily for him, one of our kennel technicians was by his cage when he started to go down, so rapid response and treatment saved his life. Due to his numerous health problems and persnickety attitude, the vet techs were primarily responsible for him–unlike most of the rescue dogs in our care, who were the kennel techs’ responsibility. As I worked with him and got to know him better, I realized that he was actually a very sweet little boy who really wanted to belong to the pack and please his superiors; he was just so terrified and confused and unsure of how to behave that his default reaction was defense. But he was very attentive, and a fast learner. Once, when I put down his bowl of food, he snapped at me. I corrected him, took food out of his bowl and pretended to eat it, then let him have access to the food, and he has never shown any signs of food aggression ever since. Quick to learn, eager to please, and really, really cute: he was actually the perfect dog who had just been given an imperfect life. When the three weeks were up and he was given a clean bill of health, a woman from the rescue asked about his behavioral evaluation. It was time to place him in an appropriate foster home. Since I had already began working with him, I told her that I would like to foster him so that I could continue what I had already started. Once home, we consulted with Steve Haynes, who is an amazing dog trainer/behavioral consultant here in town, to help me with the issues that I couldn’t handle on my own. Kody just blossomed. By the time he was ready to go to a new home, he had already found it. There was no way I was going to let this little boy out of my life. Two years later, Kody is my best little buddy. My friends have gotten over the shock of me owning a Pekingese and have fallen in love with him as well. He goes with me to most of my housesitting calls and is really amazing about just naturally falling in with the group and getting along with everyone. It’s true he’s lucky to have escaped death – both at Town Lake and after his heartworm treatment – and ended up in a loving home; but I’m lucky to have found him as well. He helped me move on after Cassia’s passing and has enriched my life in more ways than I can count. This entry was posted in Pet of the Month and tagged Kody, profile. Bookmark the permalink. I started out as a cat lover too, then a yellow lab stole my heart and once again, also liking the bigger dogs.. guess what has really got my heart now? A pembroke Corgi! And all these babies live together with me. Kody sounds awesome! Thanks, Leaming! Yeah, it’s funny how they just worm their way into your heart, whether or not you’re ready for it! Kody is SUPER-adorable and what a LUCKY LUCKY pup to have adopted you!! My sincere condolences for Cassia’s passing. It is so hard to say good-bye to a beloved pet. I am glad that Kody came into your Life when he did to help you with your mourning! Blessings to you and to Kody! Thanks, Judi! Cisco is a very special boy as well, and also lucky to have you. I look forward to seeing you and him again!